Coarsely chop the mushrooms and place them in a bowl. Finely dice the red onion and add it to the mushrooms. Use a small food processor or finely dice the carrots, cilantro, and jalapeno. If you don't have a food processor this part can be done by hand. You just want to make sure you don't have any big chunks. Add the diced ingredients to the mushroom mixture and stir to combine. Pour the lime juice and garlic salt over the mushroom mixture and mix well. Add salt and pepper to taste. Chill in the refrigerator for at least 15 minutes to let the flavors meld. Before serving peel and slice the cucumber into small rounds. 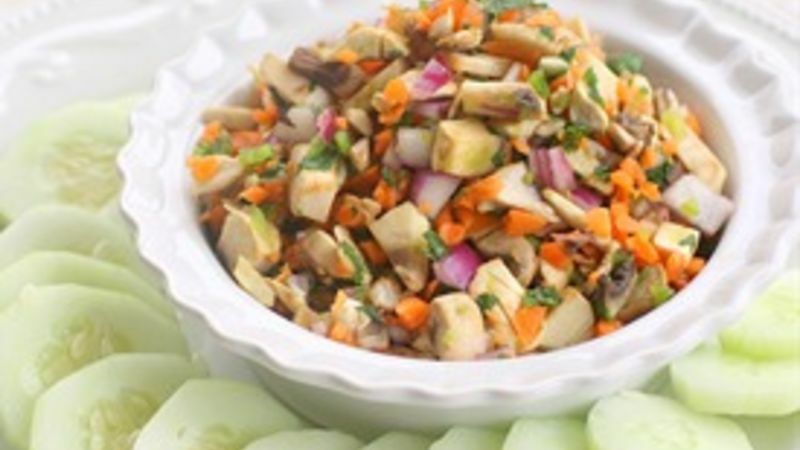 Use the cucumber slices as chips to eat your mushroom salsa. The first time I ever had to really try to lose weight was after I had my first son. I was finally enlightened to the world of healthy eating and calorie counting. I scoured the internet looking for healthy recipes and snacks to make my new found healthy living an easier adjustment. The hardest part was the initial knowledge curve but now that I know what foods are good, I’ve given up calorie counting and just make good food choices. My mother-in-law, who loves mushrooms, created this 0 Points Healthy Mushroom Salsa. It’s made up of mushrooms, carrots, onion, cilantro, jalapeno, garlic salt, and a squeeze of lime. Just chop them all up and toss them together in a bowl. Now if we used regular tortilla chips here we would be defeating the whole purpose of a healthy, low calorie salsa. Would you believe me if I said I came up with zero calorie tortilla chips? No? I wouldn’t either. Although that would almost be as exciting as the moment I discovered Diet Coke had zero calories. The “chips” we are using here are slices of crisp cucumber which still give your brain that crunch when you bite into the salsa. If you go all out and eat the whole bowl of Mushroom Salsa with the cucumber “chips” you’ve only eaten 102 calories. Congratulations on a new healthy (and addicting) snack to add to your repertoire. Want more ideas for healthier snacks? Try our Healthier Snacks recipe collection or this 20 Healthy Snacks for Spring article! What's your best idea for a healthy snack?